Video – Trailer Test Ride! When the rubber meets the road, that’s when the feeling of real accomplishment kicks in. This is the first trailer test run with our new frame and funky suspension design. We have a lot to catch you up on with building the trailer, but for now, we’re going to jump ahead with video of the first trailer test ride. 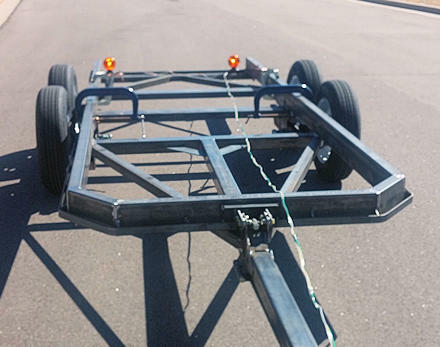 As you know from our previous posts on Economics, Trailer Build Progress and “How to setup a Trailer Frame“, we’ve been working on a new trailer design that has a few quirky design enhancements. (Maybe we can stretch it to design innovations?) Anyway, the garage is busy and there hasn’t been time to catch up on the posts. Sorry, we’ll get to that in the coming weeks. Since some of the features are new, we definitely want a trailer test before taking the parts in for powder coat. You’ll note in the video that there are clamps holding the suspension on. We wanted to be sure it all worked as expected before finalizing the position and welding. So, after testing what we could in the garage, we pulled it out and hooked it up. You can see some of the unique things like the long tongue and the suspension. Other than the clamps, loose wiring and magnet lights, we think it has a pretty nice look. Let us know what you think in the comments below. Here is some video from our first drive. Unfortunately, with the truck moving and the trailer moving, you can’t really see the suspension motion in the video. The camera shutter speed is just not fast enough to capture the action. You can definitely see it with your eye, so maybe soon we’ll hook up the GoPro on the trailer and see what we get. Anyway, here are a few short clips of the first trailer test drive. The video is not too impressive, though the rubber frame rails are kinda fun. I think the refresh rate of the camera compliments the motion of the trailer just enough to make the frame rails look like jiggly rubber. 🙂 Good thing it’s not about the video quality! We can focus on the test instead. Update: Check out the GoPro video taken of the suspension. It’s better quality for sure, and placement of the camera lets you see a bunch more. The big takeaway from our first trailer test drive is the smoothness of the ride. Over about 40 mph, the trailer just disappears — meaning you can’t feel a thing from the drivers seat. (With the exception of big bumps and potholes.) Smoothness is one of the objectives we set out for, so I’m pleased. The suspension helps with that, and so does the long tongue. The long tongue is probably too long in many practical ways, but it’s a great experiment, and we definitely feel the stability contribution. Need more? Here are more posts about how the suspension works, how the tongue folds, and (soon) the weight balance. If you want to build one, planse are available for two sizes in the Mechanical Elements store. Thanks for watching the video with us.